While the new Pope, Francis, has made a point of emphasizing simplicity—rather than wearing the usual gold ring, he has insisted on one made of silver—today he gave way to Vatican tradition and formally assumed his office following most (but not all) of the elaborate ceremonial script worked out in minute detail over more than a thousand years. Even within this deeply traditional institution, the script has changed, sometimes quite substantially. While the new Pope, Francis, has made a point of emphasizing simplicity—rather than wearing the usual gold ring, he has insisted on one made of silver—today he gave way to Vatican tradition and formally assumed his office following most (but not all) of the elaborate ceremonial script worked out in minute detail over more than a thousand years. Even within this deeply traditional institution, the script has changed, sometimes quite substantially. Popes are now “inaugurated” and not crowned; Pope Paul VI, in 1963, was the first who declined to wear a crown, although he was still carried about in a special papal litter (la sedia gestatoria), a kind of portable throne—a practice that his successor, the short-lived John Paul I, abandoned in 1978. And Francis obediently read from the heavy Latin tomes held up in front of him by the papal retinue, after being led outside St. Peter’s Basilica by hundreds of men in golden robes and tall white hats who chanted solemnly in Latin and flowed like a gold ribbon through the aisles of the church. On the loggia of the basilica, they faced hundreds of thousands of faithful who had gathered in the arms of the enormous colonnade in St. Peter’s Square. I will tell you the story. During the election, I was seated next to the Archbishop Emeritus of São Paolo and Prefect Emeritus of the Congregation for the Clergy, Cardinal Cláudio Hummes—a good friend, a good friend! When things were looking dangerous, he encouraged me. And when the votes reached two-thirds, there was the usual applause, because the Pope had been elected. And he gave me a hug and a kiss, and said, “Don’t forget the poor!” And those words came to me: the poor, the poor. Then, right away, thinking of the poor, I thought of Francis of Assisi. The inauguration, though it kept closer to the script, was not without similar touches. 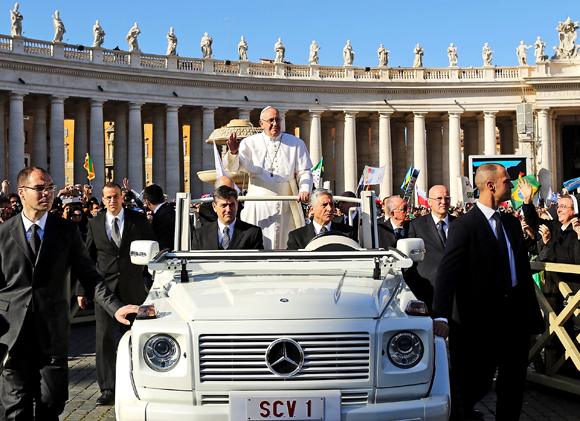 Francis made a couple of trips around the piazza in the so-called Popemobile, a kind of customized white jeep or golf cart the Popes have used in the past thirty-five years to circulate around the large piazza. After the assassination attempt on John Paul II, a heavy bulletproof plexiglass sheet was added to the front of the vehicle for better security. Francis dispensed with the shield and even stepped down from the Popemobile to embrace a severely disabled man in the crowd. The messages of his first two homilies—the one he pronounced at the Sunday Angelus service and the one at today’s inauguration ceremony—were short, simple, and highly inclusive. He recounted the story of the adultress from the New Testament on Sunday: “He who is without sin, let him cast the first stone.” He quoted an old woman who had told him that without mercy the world would not exist. “I asked her if she had taught theology at the Gregorian University,” he said, joking about the Jesuit university in Rome. Joseph is the custodian, he protects Mary and Jesus…. We must remember that service is power. He does so not out of weakness but out of strength. We must remember that service is power. We must be custodians, caring for others, caring for the Church but also for those outside the Church, stewards of the environment and all of creation. Residents in the St. Peter’s area noted that both the number of spectators and the enthusiasm for the new pope have been higher this year than in 2005, when Joseph Ratzinger became Pope Benedict XVI. But this should not be mistaken for a retreat on matters of traditional doctrine. The initial impression is that what Francis and others in the Church have in mind is a Church that is more pastoral, more attentive to the needs of the poor than its traditional prerogatives, and more forthcoming with the outside world, but no less firm about issues—whether gay marriage, sexual morality, or the contraception provisions in Obama’s healthcare reforms—that have divided many Catholics. Pope Francis is clearly enjoying a honeymoon period; the conflicts are yet to come, and we will see whether the Church’s new tone will change the nature of the debate.